This is very exciting a research press release from the Federation of American Societies for Experimental Biology. 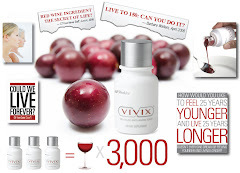 Resveratrol is the one of the main compounds in Vivix. I heard on a teleconference the other day some great testimonials using Vivix for inflammation. This testimonial was about a back injury and the person was facing a very dangerous back surgery and decided to give Vivix a try before being cut open. He was so thankful because for him it worked. The Vivix reduced the inflammation with one teaspoon and a half daily. The recommended dosage is one teaspoon, but on this call I heard some great results with increased dosages.